We had a great kayak tour with Noah. He was an excellent guide and kept everyone interested. 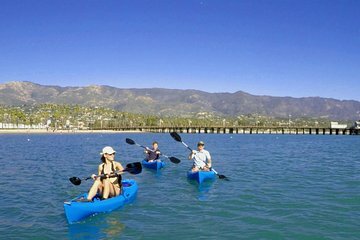 The length of the tour around Santa Barbara harbor was great for my nieces first time. Noah took us out on the 4th of July and it was awesome! He was very knowledgeable about the area and knew just right where to take us. We saw a seal, crabs, fish and a starfish on our trip. We would definitely book a tour with him again if we vacation in Santa Barbara again! Great job AJ on the tour and info of the city! This was a great tour. The guides went above and beyond to make it special for me even though I ended up being the only one on the tour. Jack was a great guide and matched the complexity of the tour to my skill level. It was great and just challenging enough to make it very interesting and worthwhile.